Kathleen and Natalie Grimes have been branching out from years of training in classical violin, piano, flute, and music theory. They enjoy both sacred and classical music, and play traditional sacred music on a regular basis in their home church. Kathleen has been a three-time semi-finalist in the World Piano Competition. Natalie currently plays 1st violin in the Hendricks Symphony Orchestra. The girls' music education took an unexpected turn in 2006 when Kathleen pursued the promise of free guitar lessons given by the leader of a Hope, Indiana- based music group, the Possum Glory Train Bluegrass Band. Accompanied to lessons and jam sessions by her violin-playing fourteen-year-old sister Natalie, and her mom, she quickly developed into an excellent rhythm guitarist. The sisters were subsequently invited to join the band and were mentored into a whole new world of music- bluegrass and fiddling. The Grimes Girls have enjoyed being on a steep learning curve ever since. While Natalie's classical violin studies continue to be the backbone of her violin experience, she is intently pursuing her new-found love of fiddling and singing. She has recently added the mandolin to her practice regimen while Kathleen has added the upright bass. 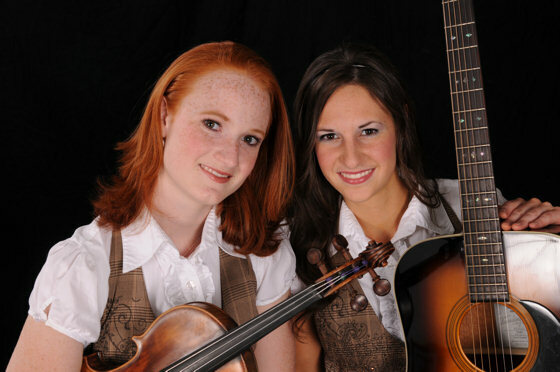 Although the sisters have only been fiddling since March of 2006, they have already earned numerous awards across their home state of Indiana, including second place in the Junior Division of the 2007 Indiana State Fair Fiddle Contest and first place in the Bluegrass Division of the 2007 Fayette County (IN) Fiddle Contest. The Grimes Girls are especially known for delighting audiences with their renditions of Draggin' the Bow and The Orange Blossom Special. Their most recent venture, into the world of Celtic fiddling, has opened up yet another dimension of music for their audiences to enjoy. Their first performance of Celtic fiddling was in September of 2007 at the Columbus (IN) Scottish Festival. Since then they have been sharpening their skills and widening their Celtic repertoire with performances at Burns Suppers in Carmel, Indiana and Louisville, Kentucky, as well as at the Indianapolis Liederkranz. They have also been invited to perform at the 2008 Glasgow Highland Games, in Glasgow, Kentucky. The Grimes Girls' ability to play several different genres of music- from sacred to classical, from bluegrass fiddling to Celtic fiddling- with precision and aplomb, causes them to be in high demand at a great variety of events. Combined with their enthusiasm, love of people, and unpredictable attempts at joke-telling, this makes them a memorable act indeed. Kathleen and Natalie truly enjoy sharing with you the talent which God has helped them to develop.